Owners or managers of commercial trucks that haul freight for customers face many challenges and risks in their operations. Unforeseen events could occur, which may include collision, vehicle damage, freight damage, injury or theft. Freight haulers get protection from their insurance coverage, otherwise, the owners or operators will have to shoulder the expenses or cost of damages, which could translate to severe financial losses, even bankruptcy. Getting a commercial truck insurance is the first line of defense against such eventualities. Different state laws and the Federal Motor Carrier Safety Administration (FMCSA) have specific insurance requirements for commercial trucks. There is a type of insurance designed for each type of trucking operations. Most states require commercial trucks to have the minimum amount of liability insurance. Truck fleet owners or operators could get their cheap truck insurance quotes from Strong Tie Insurance, a California insurance agency that provides different kinds of insurance coverage for different states. Freight moving trucks are required by both state laws and federal regulations to have the common insurance coverage for commercial trucks, such as general liability coverage, physical damage coverage, motor truck cargo insurance, excess liability insurance, and trucking workers compensation insurance. The truck fleet owner or operator is protected from personal or business loss by having the insurance cover most, if not all, of the expenses to be incurred in the event of unforeseen events that will result in damage or loss in life and property. In the event of a collision that will result in property damage, injury, or loss of life, the insurance will take care of everything, from repair or replacement of the vehicle, hospitalization of the injured, and cremation expenses for the fatality, as well as the financial damages related to the accident. Insurance shall also cover lost wages and other expenses related to the accident. Insurance coverage is also provided to damaged or lost cargo being transported by the commercial truck. In addition to the basic insurance requirement for commercial trucks, freight haulers get additional coverage for the freight that they move. Freight haulers move important and expensive cargoes most of the time. Most freight owners will not entrust their cargo to commercial freight haulers who are not amply protected by insurance coverage. Accidents happen and freight owners want to be assured that they will be compensated for the full value of their cargo should something bad happens. Shipper’s interest cargo insurance provides the owner of the freight with protection for the physical damage or loss to the cargo without having to prove liability. Shipper’s interest cargo insurance is constant unlike the carrier’s motor truck cargo insurance or carrier’s liability insurance, which may have varying exclusions. Shipper’s interest cargo insurance provides insurance protection for the physical damage or loss to the cargo, instead of the carrier’s liability, which is not always carried by the ordinary motor truck cargo or carrier’s liability insurance. Strong Tie Insurance Services can help freight truckers get additional protection for direct damage or loss to their cargo, in addition to the basic commercial truck insurance requirements of the different states and by the federal government. You can avoid great financial losses resulting from unforeseen events as your trucks deliver freight from one point to another in the continental United States. 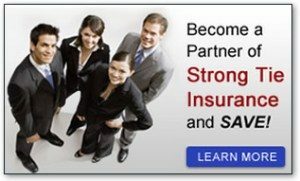 Strong Tie Insurance Services provides commercial truck insurance coverage for California, Arizona, Florida, Nevada, Oregon, Texas, and Washington State. Motor carriers that operate refrigerated trucks under their authority or those that typically transport foodstuffs will benefit from produce insurance, a specific type of commercial truck insurance designed to the needs of vehicles that work regularly in the produce shipping industry. Produce and food haulers can benefit from this specific type of commercial trucking insurance by protecting the refrigeration equipment and the perishable cargo that needs to be transported. Equipment failure that translates to cargo spoilage requires protection for both vital assets to avoid disrupting the country’s food supply and the truck fleet associated with the business. Cargo insurance is required if your trucks are in the business of transporting the property of others. It is an essential protection against unforeseen events. Cargo insurance provides protection against risks of physical damage or loss to freight due to external causes during shipping. Subject to some packing exclusions, the cargo insurance policy pays for the damage or loss regardless of which carrier is ultimately responsible. The cargo or freight insurance will cover your cargo that is damaged or spilled on the road due to an accident. It will also protect you against the expenses in the event that the client due to the damage or loss to the cargo sues your company. Physical damage insurance is a general term that applies to the different insurance coverage that protects motor vehicles. It includes collision insurance, full comprehensive insurance, or the limited fire and theft insurance with combined additional coverage. This insurance covers your trucks for the cost of repair or replacement in the event of a collision or other accidents. Strong Tie Insurance wants to help you avoid the risk of penalties and fines for your trucking fleet or limit your ability to operate your trucking business by helping you purchase the best insurance options for your business. Avoid the financial risks of unexpected expenses due to unforeseen events by getting the protection of a commercial truck insurance and other types of insurance that are suited for your business operations. We provide commercial truck insurance coverages for California, Arizona, Florida, Nevada, Oregon, Texas, and Washington.